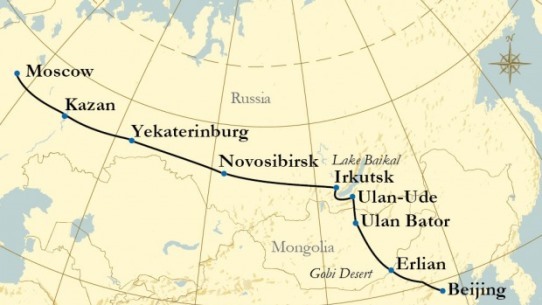 We departed Ulaanbaatar at night and around dawn we rolled up at Suchbataar on the Mongolian side of the border. We’d been told how to handle things here, leave your passport and arrival forms on the table in your compartment, stay in bed, there’ll be a quiet knock on the door, a hand will appear through the door and take them away. They’ll soon be returned. Which was exactly what happened although further down the carriage somebody had left their door locked and it took a great deal of knocking on the door to wake her up. 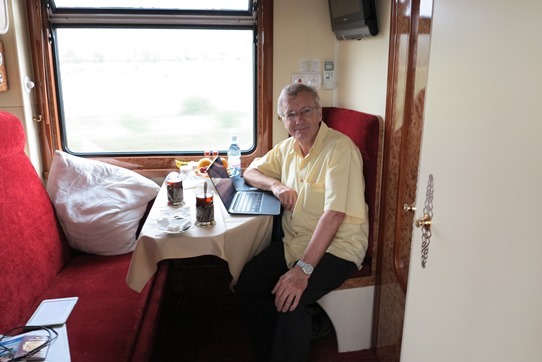 ▲ In our compartment as we roll across the border region between Mongolia and Russia. An hour later we departed Mongolia and two hours later, after breakfast, we arrived at Naushki, the Russian side of the border. Clearly there’s a very wide no-mans-land between the two countries. Our Russian guide had warned us that this was a much less friendly border than the Mongolian one, but in fact we were processed quite quickly and easily. ▲ Nevertheless it was three hours later – no photographs during that time – before we departed and another five hours before we arrived at Ulan Ude, the first town in Russia where we had a four hour stop. 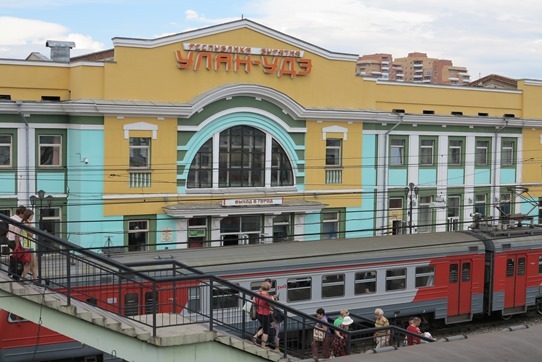 Practising my Cyrillic alphabet I can even read the station name as Ulan-Ude. 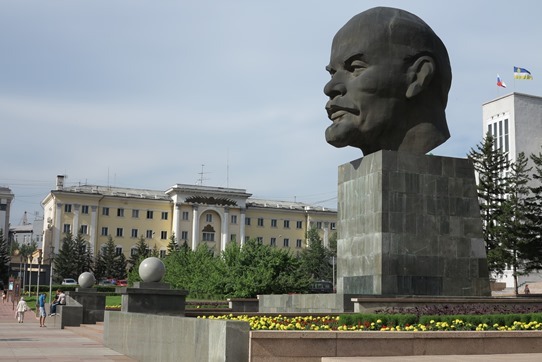 ▲ Time to check the ‘biggest Lenin head in Russia’ in the town’s main square. ▲ And the electric kiddie cars which seem to have become a feature in quite a few ex-Communist city squares. I first encountered them in Tirana, the capital of Albania, back in 2006. ▲ I’m pleased to see signs of the old Soviet era aren’t being simply forgotten, quite apart from giant Lenin heads there are features like this plasterwork in a theatre we visited. Note the hammer and sickle symbol in the middle. ▲ Finally we had dinner at a hotel’s top floor restaurant and were rewarded with a sunset rainbow over the city.